Welcome to Fr Mark Odion: Fr Mark Odion, MSP originally of Nigeria, is a priest of the Missionary Society of St Paul. He works for the Santa Marta Group of the International Department of the Catholic Bishops’ Conference of England and Wales and he is their African Project Coordinator. This group is an alliance between the Catholic Bishops Conference and the Police chiefs to combat human trafficking in our society. Fr Mark served at our Cathedral, St George’s in Southwark before becoming PP in Beckenham Hill from January 09 to August 15. Fr Mark will be in our parish this weekend to celebrate the Masses with us and will be speaking on the issue of human trafficking as it affects our community. Please take this opportunity to make a good confession for Lent! Next Week: Fr Habte Neghassi from our neighbouring parish SS Simon & Jude. St Patrick's Night - Saturday 17th March: Following on from the wonderful ‘St Patrick’s nights’ run by Mick & Giselle Cronin over the last couple of years – they hope to repeat it all again this year. Put the date in your diaries!! More details to follow. Special Sunday - 11am Mass: Sung by Cantores Missæ under the direction of Mr Charles Finch, our traditional Latin Mass today will include the following music. Ordinary: Missa brevis (Giovanni Perluigi da Palestrina); Offertory: Super flumina Baylonis (Palestrina); Communion: Sitivit anima mea (Palestrina); and after the last Gospel: Alma regina caelorum (chant). Next Special Sunday 11th Mar – Laetare Sunday. CTS Stand: Please take the time to have a look at the CTS stand in the Church porch. There are a number of books available for Lent and Easter including books of Stations of the Cross. Confirmation Programme 2018: Next Saturday (24th Feb) we will begin the Confirmation programme with a meeting for the candidates and parents at 4.30pm. Jerry Hourigan RIP: It was lovely to see so many at the Requiem Mass this past Friday, especially Mr Keith D’Cruz and many past and present members of St Bernadette’s staff. Welcome to God's Church: Gabriele Yosef Pio Bertorelli, daughter of Francesco & Miryam baptised by Fr Chris last Saturday. 2 Places on Lourdes Pilgrimage: Two places have come available for our April pilgrimage to Lourdes (5-9th). If you are interested, please give your details to one of the priests this weekend. Costs £ per person. Knock Pilgrimage 14-18th March 2018 - Spaces still available. £599 per person sharing. Wheelchair accessible rooms in the hotel. Limited single rooms at supplement of £50. Groups and Individual bookings welcome. 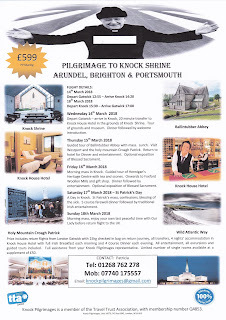 Contact Patricia anytime on 01268 762 278 or 07740 175557 or email knockpilgrimages@gmail.com. 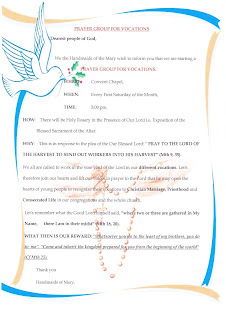 Prayer Group for Vocations: The Handsmaids of Mary also have a monthly prayer group from 5-6pm on the first Saturday of the month. 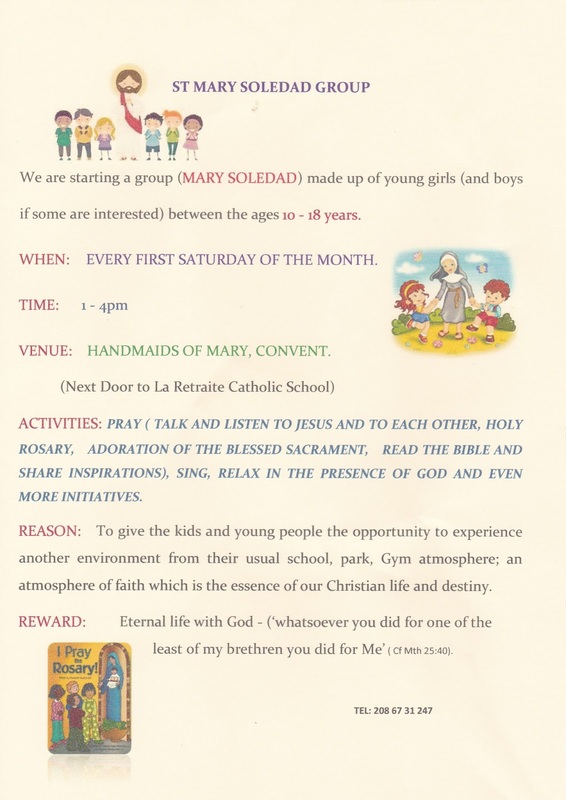 St Mary Soledad Group: We are starting a group (Mary Soledad) made up of young girls and boys between the ages of 10-18 years. 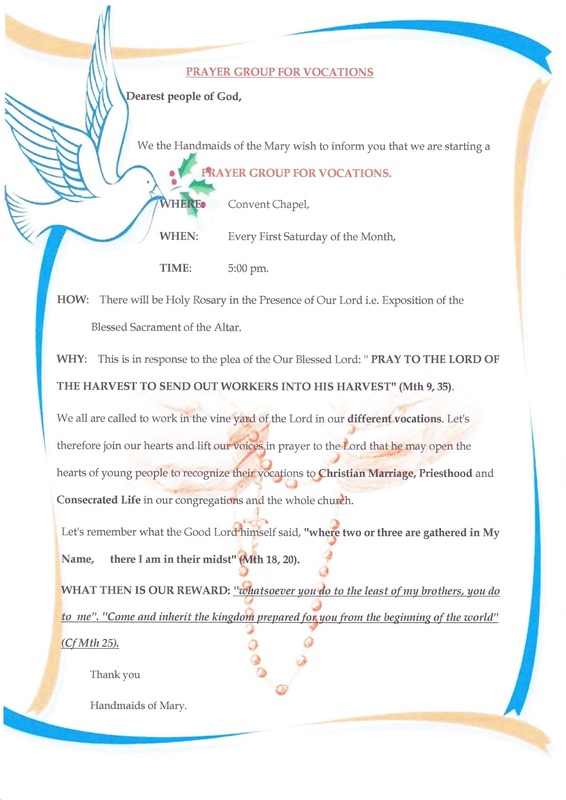 It will take place at the Handmaids of Mary Convent, every 1st Saturday of the month from 1pm to 4pm. See poster for more details. Cleaners this week: Ella Shllaku, Elizabeth Vosas, Maria Eugenia Galvis & Anais Tarelho. Calling all Pensioners! Come along for a light lunch and game of Bingo every Tuesday 12-3pm at Corpus Christie Church hall, 11 Trent Rd, Brixton, London SW2 5BJ. All welcome! Catholic History Walks: Please see poster for more details. You can contact chwalkslondon@gmail.com or Facebook or see catholichistorywalks.com. Cost £5, concessions available. Please wear suitable footwear and plan for the weather. Walks may take up to 2 hours. Lift up your heads, O Gates! - Monday 12th February 3pm; Wednesday 21st February 2pm; Tuesday 10th April 2pm; Monday 23rd April 6pm. Starting at the Church of the Precious Blood, The Borough. 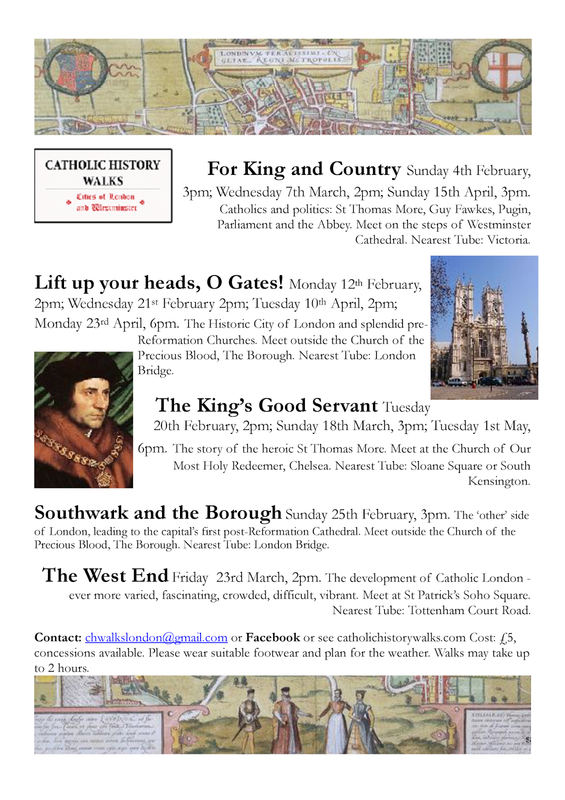 The King's Good Servant - Tuesday 20th February 2pm; Sunday 18th March 3pm; Tuesday 1st May 6pm. Starting at the Church of Our Most Holy Redeemer, Chelsea. Southwark and the Borough - Sunday 25th February 3pm. Starting at the Church of the Precious Blood, the Borough. The West End - Friday 23rd March 2pm. Starting at St Patrick's Soho Square.